Paige @ Pt England School: Will He Save her! It was a dark night and Mary Jane was walking around until she saw a shadow behind her. It kept on following her and following her until someone quickly grabbed her and covered her eyes and mouth, to stop her from seeing anything and to stop her from screaming for help. Mary Jane was Spider man's best friend, but suddenly Spider man felt strange like something bad has happened to Mary Jane. And indeed something bad has happened to Mary Jane, because a while back Spider man put a tracking device on Mary Jane just In case something bad happened to her which he didn't know about. And when Spider Man followed the tracking device it leaded him to this abandoned tower where Mary Jane has been held. Spider man took the risk and went inside the abandoned tower, and while he was walking he was taking step by step just in case he got caught by any bad guys. He kept on walking until he heard voices so he followed it and it took him to stairs, and then the voices stopped so Spider man went all the way up. He stopped because their was a strange looking door, so he took a breath and opened it. But strangely when he opened it lead him to the top of the building but no one was up there. So then he turned around and he saw Mary Jane but not just Mary Jane he saw a evil villain named Danger! Spider man said “Danger please hand over Mary Jane to me and then no harm will be caused”. So then that's what Danger Wanted, He wanted to cause danger because he wanted to take over the world so Danger, Refused to hand over Mary Jane. So Mary Jane scratched Danger and then Danger said “If you want her why don’t you go get her”. 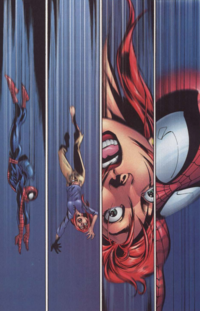 So Danger pushed her off the building and then Spider man went after her. Spider man couldn’t fly so he was just climbing down the building really fast. Mary Jane closed her eyes and she thought that she was going to die until she stopped and she opened her eyes and she got caught by Spider man. Mary Jane said “Thank you for saving my life I really appreciate it”. So she threw a celebration party just for Spider man for saving Mary Jane's life the End.